Cloisonné, an ancient metalworking technique, is a multi-step enamel process used to produce jewelry, vases, and other decorative items. Objects produced by this process are also called cloisonné. Cloisonné first developed in the Near East, spread to the Byzantine Empire, and from there along the Silk Road to China, Korea and Japan. The technique was also highly developed in Europe. Chinese cloisonné is probably the most well known and ubiquitous. Russian cloisonné from the Tsarist era is highly prized by collectors. To produce cloisonné, patterns such as flowers or leaves are outlined with thin copper or bronze wires glued or soldered to a metal base, forming cells (cloisons) which are then filled in with thick, colored enamel pastes. The object is fired at a low temperature to harden the enamel, and the surface is then ground smooth with abrasives and polished. Finally, the wires and base are electroplated with gold. Cloisonné techniques became highly refined during the late nineteenth and twentieth centuries. Cloisonné decorative items, jewelry and giftware continue to be very popular. Foreign influence contributed to the development of cloisonné during the early fourteenth to fifteenth century in China. The earliest securely dated Chinese cloisonné is from the reign of the Ming Xuande emperor (1426–1435); these pieces include incense-burners, boxes, plates, animal and bird shapes, and ornamental objects for the desks of scholars  However, cloisonné is recorded during the previous Yuan dynasty, and it has been suggested that the technique was introduced to China at that time via the western province of Yunnan, which, under Mongol rule, received an influx of Islamic people. A very few cloisonné objects have been dated on stylistic grounds to the Yongle reign (1403–1424) of the early Ming dynasty. 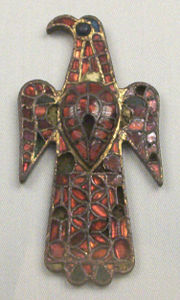 The base of this ware is of copper, and designs an it are in five colors, made with chemicals and fired. It is similar to the Fo-lang-k'an (enamel ware). I have seen pieces such as incense-burners, flower vases, boxes, and cups, which are appropriate for use [only] in a woman's apartment, and would be quite out of place in a scholar's studio. It is also known as "Ware from the Devil's Country" (Kuei-kuo yao). By the period of Emperor Xuande (1426 – 1435), this ware came to be greatly prized at court. During the 'Jingtai' period of the Ming Dynasty (1426-1456), the emperor, who was very interested in bronze-casting techniques, improved the color process, and created the bright blue that appealed to the Oriental aesthetic sense. After a processing breakthrough, most articles for his daily use were made of cloisonne; in time, blue cloisonne became known as 'Jingtai Blue.' At that time, the Chinese possessed excellent conditions for developing cloisonne enameling; they already had advanced metallurgical technology, and glass and glaze production techniques were well-understood. The soft, smooth enamel with its delicate ornamentation and lustrous color appealed to Chinese tastes. During the reigns of Emperors Kangxi and Qianlong of the Qing Dynasty (1644 - 1911), cloisonne improved and reached its artistic summit. Colors were more delicate, filigrees more flexible and fluent, and scope was enlarged beyond the sacrifice-process wares into snuff bottles, folding screens, incense burners, tables, chairs, chopsticks, and bowls. The general method for making cloisonné involved first soldering brass wires to the surface of a copper object to form a pattern or illustration; then, according to the requirements of each pattern, colored enamels were filled in. Enamel was made by melting different materials such as red lead, boric acid borate, and glass powder together to become an opaque or translucent glistening substance. A variety of oxidized metals were added, and the substance then changed into enamels of different colors, or enamel coloring. Popular colors used during the Ming Dynasty were red, yellow, green, black, purple, cobalt blue and turquoise. After the melted enamel cooled and became solid, it was then ground into powder and mixed with water to make a paste which could be used to fill in the pattern. After the spaces delineated by brass wires on the copper object were filled in with enamel paste, the object was fired. After each firing, the enamel would contract, producing an uneven surface. It was then necessary to fill in the uneven places with enamel paste of the same color many times over and repeat the firing process, until every filled-in space became thoroughly smooth, without any depressions. The fired enamelware then had its surface polished smooth, so that the soldered brass wire pattern and the enamel substance were melded into one. Finally, the exposed brass wires between parts of the patterns as well as the rim and the bottom of an object, to which enamel had no been applied, were gold plated. Early in the eighteenth century, a technique developed in Limoges, France, in which the metal or porcelain base is completely covered with a base coat of enamel, and colorful designs are painted on top before firing, was imported to China. Known as “foreign porcelain” by the Chinese, it was produced mostly in Guangzhou for export. Techniques of cloisonné production quickly spread to Korea, where Korean artisans developed unique styles and designs based on Chinese pieces. During the Joseon Dynasty, artisans produced exquisite items for personal use, such as ornamental daggers, hair pins, bracelets, boxes and containers for perfume. Around 1838, a former samurai, Kaji Tsunekichi (1803 - 1883) of Nagoya in Owari Province (modern Aichi Prefecture), obtained a piece of Chinese cloisonné enamel, and by taking it apart and examining how it was made, he eventually produced a small cloisonné enameled dish. By the mid-1850s he was sufficiently confident take on pupils and by the late 1850s was appointed official cloisonné maker to the daimyō (feudal chief) of Owari. He based his designs on the motifs and color-schemes of Chinese cloisonné enamels and his early works are characterized by the use of a larger number of background wires, both as an integral part of the design, and to prevent the enamels from running during firing. One of Kaji’s pupils, Hayashi Shōgorō (d. 1896), taught many of the later masters of cloisonné enameling, of whom the most important was Tsukamoto Kaisuke (1828-1887), who created a picture of Nagoya Castle, the first time a purely representational design had been realized in cloisonné enamels. After the Nagoya Cloisonné Company won a first prize at the Vienna Exhibition of 1873, many cloisonné-manufacturing companies sprang up in and around Tōshima and the area rapidly became Japan’s main centre of cloisonné production, becoming known as Shippō-chō (Cloisonné town). The Meiji government, under a program to modernize Japan’s existing industries, invited the German Ahrens company to Japan, and the German chemist Gottfried Wagener introduced modern European enameling technology. In Japan, cloisonné developed in to a fine art as well as an industry. The Andō Company developed new techniques, such as moriage (piling-up), a painstaking building up of layers of enamel to produce a three-dimensional effect; and plique-a-jour (shōtai-jippō) in which the copper interior body of a piece was dissolved with acid after the enamel had been fired, leaving a semi-transparent cloisonne shell. Cloisonne is still a popular decorative technique, used to produce ornamental items, gifts and souvenirs, and many types of jewelry including earrings, brooches, bracelets and cloisonné beads. Today, more than 40 colors of enamel are available. First, the artist forms metal (such as copper or brass) into the shape of the finished object. A paper pattern and a pencil are used to transfer a design to the metal object. Partitions (French: cloisons) that act as color-separators are applied according to the transferred pattern and are held in place by a soldering paste (this is finely divided metal of low melting temperature in a flux paste). The partitions are bent and cut to length from flat wire stock (usually by hand using simple pliers) while the paste is applied with a small brush. Heating the piece in an oven permanently affixes the partitions to the base metal by melting the solder. The piece is then allowed to cool. Frit (glass crushed to a powder) in a water-based paste is painted into the partitions using an annotated pattern similar to the "paint by numbers" craft technique. After the frit has dried, firing in an oven melts it onto the metal. Several repetitions of the process may ensue to build up the coatings to the height of the partitions. Various colors and transparencies may be used in combination within a single partition to obtain the desired artistic effect. The glass and a portion of the cloisons are ground and polished to form an even and smooth surface. The exposed metal is electroplated with a thin film of gold to prevent corrosion and to give a pleasing appearance. Chinese Imperial Queen's headdress of the Ming Dynasty, leaf patterns are made in a single light blue color with each element bounded by a rim, making this a work with cloisonné rather than simply enameled copper. ↑ Dept of Asian Art, Metropolitan Museum of Art. Retrieved December 22, 2007. ↑ "Japanese Cloisonné: the Seven Treasures" The History of Cloisonné Enamels in Japan (1838 – 1871) Japanese Cloisonne, The Victoria and Albert Museum. This page was last modified on 6 March 2017, at 20:41.